20 February What Care Can or Can't a Homecare Agency Deliver? For many people, aging isn't an easy process. The difficulties extend far beyond seniors, however; family members and friends are also faced with decisions that arise from aging, as they look for ways to ensure their loved ones are well cared for in their golden years and beyond. Homecare is an excellent choice for many people, but it's important to understand there's a big difference between homecare and home healthcare. Here, we'll explore some of the differences between homecare and home healthcare, as well as the major benefits to each. What's the Difference Between Homecare and Home Healthcare? Homecare is delivered by people who are all-around caregivers. Think of these people as sort of life coaches for seniors. They help them get their day-to-day tasks done in order to ensure they're living a healthy, happy life. Home healthcare is clinical medical care that focuses more on health administration than regular daily living. Homecare professionals, just like home healthcare professionals, are specially trained to work with seniors; however, the training of these two professions is quite different. Still aren't sure about what's the best option for your situation? Not a problem, please reach out to us and we will talk you through your unique situation. Who are Home Healthcare Professionals? Home healthcare professionals are trained in the medical field. These people are often registered nurses, occupational therapists, physical therapists, or other people who have undergone specific medical training. Typically, home healthcare is administered as part of a follow-up regimen after a person has been hospitalized or sustained a significant injury or illness. After a patient is released from the hospital, home healthcare professionals can help that person transition back to independence by providing in-home medical attention. This is often not, however, a long-term solution. Rather, home healthcare is a solution that's in place so seniors can get back on their feet following a health scare of any sort. Homecare providers, on the other hand, exist to help seniors with daily tasks on a long-term basis. Homecare professionals are often called homecare aides. These individuals are specifically trained to work with seniors. Understanding older adults' nuances and needs is a particular specialty of homecare aides. These professionals are considered non-clinical workers, but it's important to understand that "non-clinical" does not equal "non-essential". In fact, the work homecare professionals do is imperative to seniors' livelihoods and is often used in conjunction with home healthcare, as these two segments are quite different but operate in a complementary fashion. 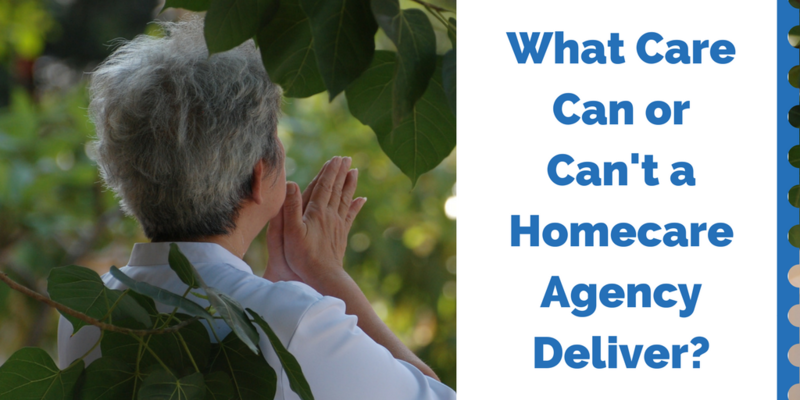 What Kind of Care Can Homecare Professionals Provide? The CDC estimates 82.6 percent of seniors used long-term care between 2013 and 2014. Undoubtedly, that number has grown, given the number of aging Baby Boomers. Let's take a look at a few examples of how the people who use homecare services are able to live more independent lives. Transportation: The CDC states, "In 2015, there were more than 40 million licensed drivers ages 65 and older in the United States." In the same year, more than 6,800 older adults were killed and more than 260,000 were treated in emergency rooms for injuries related to car crashes. Homecare providers eliminate the worry associated with seniors on the road. They help them run errands, such as seeing the doctor, going to the grocery store, or picking up prescriptions. Taking car keys away from seniors is never easy, but when they know they'll still be able to do everything they're used to doing, the conversation gets a lot easier. Personal Grooming: Many seniors struggle to stay clean as mobility becomes an issue. Homecare providers help their patients bathe, get dressed, and use the restroom. Companionship: Loneliness can be an incredibly painful disease. Oftentimes, homecare providers simply provide a bit of friendship. They're an ear that's there to listen, and for patients suffering dementia or Alzheimer's, homecare professionals can help ground them, providing them with cues that keep their memories in the present. Every person's situation is different, so there certainly is no one-size-fits-all solution when it comes to senior care. What's important is learning about all the different options of care available so you can arm yourself with all the necessary knowledge to ensure you make the right choice for your loved one when the time comes. When you know what kind of services homecare agencies offer up front, the decision will be easier to make down the road, and you won't feel rushed or panicked to pick a provider without having the proper information to guide your judgment. If you have questions about homecare, we invite you to reach out to our team of caring professionals. We're happy to talk to you about your family's situation and give you the best guidance we can.